Pioneers of Fibreglass industry in the Maldives. Builds from 80ft to 8ft. Diving Dhoni, Cruise Dhoni, pleasure crafts, ferry boat and high speed transfer and ferry boats are in our range of production. Yard located in Thulusdhoo Island, Kaafu Atoll, North Maldives. Web Site Snapshot: If available, above is a snapshot of the Precision Marine Pvt. 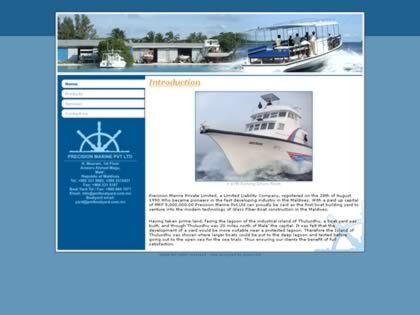 Ltd., web site at http://pmlboatyard.com.mv/ as it appeared when this site was added to the directory or last verified. Please Note that Boat Design Net has no involvement with the above web site; all content and images depicted in the above thumbnail are the property and copyright of Precision Marine Pvt. Ltd., unless otherwise noted on that site. Description: Pioneers of Fibreglass industry in the Maldives. Builds from 80ft to 8ft. Diving Dhoni, Cruise Dhoni, pleasure crafts, ferry boat and high speed transfer and ferry boats are in our range of production. Yard located in Thulusdhoo Island, Kaafu Atoll, North Maldives.